Mystic, born 17 June, 1603; died at Osimo 18 September, 1663; feast, 18 September. Joseph received his surname from Cupertino, a small village in the Diocese of Nardò, lying between Brindisi and Otranto in the Kingdom of Naples. His father Felice Desa, a poor carpenter, died before Joseph was born and left some debts, in consequence of which the creditors drove the mother, Francesca Panara, from her home, and she was obliged to give birth to her child in a stable. In his eighth year Joseph had an ecstatic vision while at school and this was renewed several times; so that the children, seeing him gape and stare on such occasions, lost to all things about him, gave him the sobriquet "Bocca Aperta". At the same time he had a hot and irascible temper which his strict mother strove hard to overcome. He was apprenticed to a shoemaker, but at the age of seventeen he tried to be admitted to the Friars Minor Conventuals and was refused on account of his ignorance. He then applied to the Capuchins at Martino near Tarento, where he was accepted as a lay-brother in 1620, but his continual ecstasies unfitted him for work and he was dismissed. His mother and his uncles abused him as a good-for-nothing, but Joseph did not lose hope. By his continued prayers and tears he succeeded in obtaining permission to work in the stable as lay help or oblate at the Franciscan convent of La Grotella near Cupertino. He now gave evidence of great virtues, humility, obedience, and love of penance to such an extent that he was admitted to the clerical state in 1625, and three years later, on 28 March he was raised to the priesthood. Joseph was but little versed in human knowledge, for his biographers relate that he was able to read but poorly, yet infused by knowledge and supernatural light he not only surpassed all ordinary men in the learning of the schools but could solve the most intricate questions. His life was now one long succession of visions and other heavenly favours. Everything that in any way had reference to God or holy things would bring on an ecstatic state: the sound of a bell or of church music, the mention of the name of God or of the Blessed Virgin or of a saint, any event in the life of Christ, the sacred Passion, a holy picture, the thought of the glory in heaven, all would put Joseph into contemplation. Neither dragging him about, buffeting, piercing with needles, nor even burning his flesh with candles would have any effect on him — only the voice of his superior would make him obey. These conditions would occur at any time or place, especially at Mass or during Divine Service. Frequently he would be raised from his feet and remain suspended in the air. Besides he would at times hear heavenly music. Since such occurrences in public caused much admiration and also disturbance in a community, Joseph for thirty-five years was not allowed to attend choir, go to the common refectory, walk in procession or say Mass in church, but was ordered to remain in his room, where a private chapel was prepared for him. 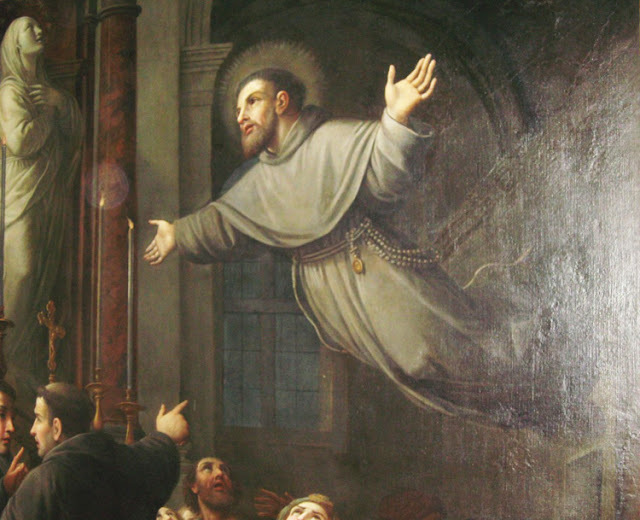 Evil-minded and envious men even brought him before the Inquisition, and he was sent from one lonely house of the Capuchins or Franciscans to another, but Joseph retained his resigned and joyous spirit, submitting confidently to Divine Providence. He practised mortification and fasting to such a degree, that he kept seven Lents of forty days each year, and during many of them tasted no food except on Thursdays and Sundays. His body is in the church at Osimo. He was beatified by Benedict XIV in 1753, and canonized 16 July 1767 by Clement XIII; Clement XIV extended his office to the entire Church. His life was written by Robert Nuti (Palermo, 1678). Angelo Pastrovicchi wrote another in 1773, and this is used by the Bollandist "Acta SS. ", V, Sept., 992.